Would not be too surprised, anyone know its credibility? This fits in perfectly to “those who came before” Look into AC2 if you’re not sure. Yes, the bible does speak of giants. But so do most of the religions, recently i watched a documentery on “those who came before” and apparently they came from the sky in a ball of fire – Egyptians. The chinese also believe one came from the skys in a dragon. Now think about a drag? Fire breathing from it’s mouth? It’s very much like a rocket. i agree the rocket and dragon could very easily be one in the same. has anyone had come back on the credibility of this image? i watch ancient aliens, really interesting show. it will blow your mind all the bizarre proof and thoeries on there. i believe this because they took a human jaw bone of today and compared it to a skull of one of the “giants”. craziness eh? Photo shopped. Look at the shadows. Specifically the pick axe, which isn’t casting a shadow at all. Genesis6:1-2 refers to “sons of God”translated from Hebrew words; BeneHaElohim and refers exclusively in the O.T. to “angels” Job chapters 1,2,38.The Septuagint translates this term as “angels”.The “daughters of men” benoth adam,are the daughters of Adam.Genesis 6:4 refers to the Nephilim,which mean “fallen ones”Those were the hybrids that resulted from the mischief between the fallen angels and human women.It also means HaGibborim “the mightly ones”that was translated into the Greek Septuagint as “gigantes” which does not mean “giants” but “earth-born” from the Greek word gigas.Jude 6-7 confirms the fallen angels going after strange flesh are to suffer the vengeance of eternal fire.In the O.T.certain tribes;the Rephaim,Emim,Horim,Zamsummin are all Nephilim.Og the king of Bashan is the King of the Giants(Nephilim)in Deut.3and Joshua12,Goliath had four brothers who alsowere a derivative offspring of the Nephilim.Abrahams seed was targeted.This is the reason for the Flood,for Noah was distinctive in that his genealogy was not blemished.Gen 6.
if u belive in creation of this earth, existenced of mammoth, dianosorus etc then why cant we belive the existence of giants that is mentioned in the Holy Bible? This picture is apparently made by someone called IronKite in a contest on a website called worth1000. I’m not sure though.. 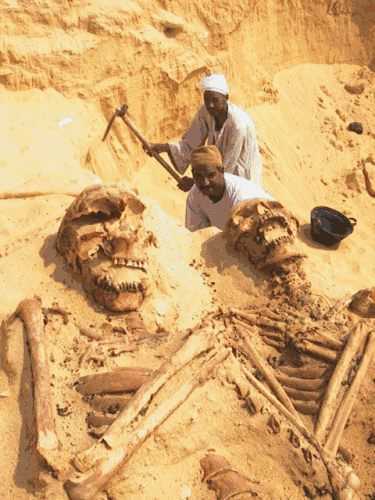 It looks like an optical illusion to me, in that the skeletons are closer to the camera than the two men, making the skeletons appear large.